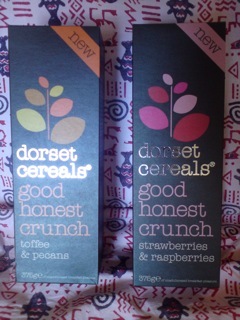 We received these from Dorset Cereals to promote their new Good Honest Crunch range of cereals and I thought that both were similar enough to do a double review. First I went for the strawberry and raspberry flavour which suited me to a T. The crunchiness of the name is from almost sugar-puff like larger elements within the cereal, which give a soft but satisfying crunch. The rest of the cereal is made up of clusters of grain and fruit with a few healthy looking things scattered here and there. It turns the milk pink and doesn't go soggy which are both plusses too. I really enjoyed this box and demolished it in a short space of time. I think this occupies a space in between mueslis and standard cereals. I feel that I'm getting enough healthy goodness but also I have the fruit to add some needed sweetness. Plus neither of these have raisins or sultanas to overpower & bulk out the package which is a definite plus. I intend to buy these again. I put off the toffee flavour for a while - the sound just didn't appeal to me. Toffee isn't a flavour I'd associate with breakfast and it's not a particular favourite of mine. On opening the bag the smell inside was strong and a little off-putting, but one taste of the actual package put my fears to rest. The toffee is present, but it's a smooth and subtle flavour and plays second fiddle to the crunchy pecans. While there is still some of this box left it's definitely a good cereal and I'd urge people to try it before judging it like I did. I'd probably go for the red flavour first out of the two, but if there was a multi buy special offer then I'd happily grab one of each. The boxes seem a little small, but the cereal inside packs a lot of ideas into a lovely recipe. I hope they continue to make surprising breakfast cereals for me. I'm still crazy jealous of the Dorset selection over your way. We're supposed to be getting a few new options in the US but I'm yet to see them in stores on either coast.